Welcome to the official website of the original CARAMOAN TRAVEL AND TOURS SERVICES (now PASAHERO TOURS), the only true original and pioneer travel operator in Caramoan. Our travel company will bring you not only to Caramoan islands but we have additional tours exclusively for our clients only such as Crystal cave, Kamot cave, and Libho Park... that difference is our pride. 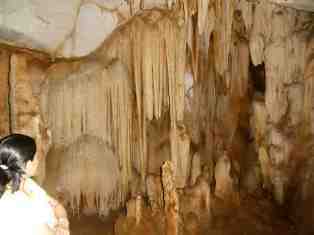 ​CARAMOAN ISLANDS TOUR PACKAGE + EXCLUSIVE TOUR TO CRYSTAL CAVE, KAMOT CAVE, & LIBHO PARK !!! 2019 CARAMOAN SPECIAL LIMITED OFFER ! Inclusive of Tours and Adventure activities, chartered island hopping boat, land transportation within Caramoan with free pickup & and drop-off from Guijalo Port or Caramoan Bus Terminal, entrance fee, tour-guide services, and accommodation. (Beachfront and Near-Beach rooms). Round-trip pickup/drop-off Guijalo port or bus terminal: - FREE! MORE ADVENTURE...MORE PLACES... MORE FUN !!! Cave-B- Kamot Cave Tour... a small rock formation looks like Alien's in Predator movie. Enjoy island hopping with your private boat touring you around the clusters of adorable paradise islands of Caramoan. Swim on its blissful turquoise-crystal waters, have a sunbathing on its milky white sands, climb the stunning stones made of pure solid marbles soaring on it heights, discover the vibrant coral havens and its diversified ecosystem, explore the depth of caves and its sparkling stalagmite and stalactite crystals, catch a glimpse on the scenic views...watch and feel the warmth breeze of our mother nature,...engulf yourself with serenity feel how it can truly unwind your mind, fade your stress, renew your strength, and invigorates your life!!! Come and set foot on the shores of Caramoan Islands where amid of many places around the world... this hidden paradise has been the most chosen and and became favorite place of multi-international producers and film makers of "Survivor Reality Game Shows" which includes French, Israel, Bulgarians, Serbians, then Israel part-II (celebrity edition), Swedes, then the so called "four season" composed of 4 countries (Netherlands-, Belgium, Norway, Denmark),the Indians...and recently US survivors... and now Survivor Fever has become perennial. Many countries has come and goes back perennially and now we are waiting them this 2018. Places to be visited may includes Matukad island, Lajos island, Tinago beach, Tinaguan cave, Tayak Lagoon, Minalgos island/cave, Our Lady of Peace at Mt Caglago-Tabgon,Sabitang laya, Bag-ing, Cotivas island, Lahuy island clusters of long stretched beaches such as Bugtong and Manlawi, Lighthouse beach in Ginao-an together with unnamed group of islets, Bulangbugang underground fresh water cave and other more. 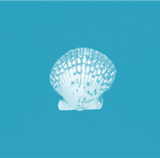 The visit to the said places can be optimized subject to the available time frame and the earlier the guest arrives the better chance of visiting more places, we also consider sea tide level (as we can't take risk of running the boat on coral reefs), weather conditions, and customer's preferences for places they wanted. Note: If some of the islands may not be available during the tour due to "Survivor Reality Show Activities" we will not give discount in terms of money but we will compensate the time it by letting you stay longer to some available islands and other tourist spot. Why Caramoan can be reached by bus? Many has been puzzled why and how Caramoan can be reached by land while it is an island. 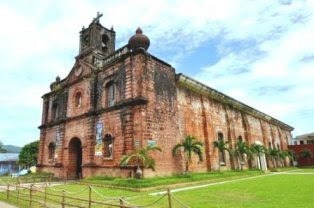 The truth is Caramoan is composes partly peninsula and partly group of islands,which by geographical definition peninsula is an area of land composes almost surrounded by water with a certain portion connecting to the mainland. 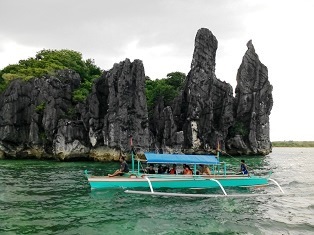 Thus, enabling the travelers going Caramoan directly from the mainland Luzon specially from Manila.However, most the white-sand travel destinations are located to the congregate groups of island such as Matukad area and Lahuy group of islands area. Most of them are no inhabitants and no man-made structures even comfort rooms to preserve the ambiance of nature's purity.I'll make it very very clear because almost all inquiries has been asking me again and all over again regarding this matter. Note: You can bring you private vehicle if you want. Otherwise, please refer to our suggestions below when using public utility transport: (Schedule may be changed without prior notice). MANILA-CARAMOAN (Raymond Transport Bus) BETTER OPTION!!! Manila to Caramoan "direct-land travel" is is now the best choice and the most convenient way if you are travelling from Manila to Caramoan mainland. Fare is more or less P1,000 only depending on the type of bus you want to choose. ETD is 3pm at Cubao Terminal near the crossing of Aurora Blvd - EDSA. Please choose the air-conditioned bus for a faster and more convenient experience. Boat transfers is no longer needed. NAGA -CARAMOAN ( Raymond Transport Bus, MRR, and Florencia Bus) BETTER OPTION !!! If you are coming from Naga City choosing the "direct-land travel" by bus is now the best choice and the most convenient way of travelling from Naga to Caramoan mainland. Fare is more or less P250 only depending on the type of bus you want to choose. There are available buses such in Naga Central Bus Terminal such as Florencia Bus, MRR, and Raymond Trans. All buses are now fully air-conditioned. You may choose bus for a faster and more convenient experience. Boat transfers is no longer needed. Schedule of buses are more or less 3:30 AM, 6:00 AM, 9:00 AM, 12:00 NN, 2:30 PM, and 3:00 PM. If you want to travel by airplane, there are also direct flights from Manila to Naga/Pili Airport. The Philippine Airlines, Cebu Pacific, Air-Asia flies regularly from Manila Airport Terminal 3. Travel time will take more or less 45 mins. Airfare is fluctuating at an average of more or less P2,000 depending on the season and the time of booking... the trick is that the earlier you book the cheaper rates you'll get. Once you’re in Naga Airport you can take option B or D depending on your own discretion. If you’re from Naga City, go to Van Terminal near the side-front of SM City Naga and take air conditioned VAN Bound to Sabang Port fare is P100/person and travel time is more or less 1 hour and 30 mins. Once you’re in Sabang Port look for commercial boats (Bangka) bound to Guijalo Port fare is P120/person travel time will take 2 hrs. Trips starts and continues more or less 6AM, 7AM, 8AM, 9AM, 10AM and 11AM, with an extra trip up to 2PM but sometimes time not available cause it depends on the volume of passengers only. SO THE SUGGESTED TIME IS ON EARLY MORNING AS POSSIBLE!!! (6AM-9AM) to ensure your travel. If can't take the 9AM trip at least make sure you don't miss the regular last trip around 10AM or 11AM otherwise you may need to charter your own boat for Php2000-3,000 if the 2pm schedule is not available. If you are from Metro Manila, take air-conditioned bus from Araneta Center Cubao or in Pasay City Bus Terminal bound to Naga, fare is ranging from P700-1,000 depending on the type of bus you may choose. Then, once you're already you have 2 options,... you can choose a bus directly to Caramoan and that's more comfortable just follow Option B instructions, or if you want to travel by sea via Sabang Port go to FILCAB van terminal the back of SM Naga and follow the steps above mentioned in Option D.
If you're from Metro Manila, take air-conditioned bus from Araneta Center Cubao or in Pasay City Bus Terminal bound to Naga as of now Penafrancia Tours and Philtranco are the only available, fare is ranging from P700-1,000 depending on the type of bus you choose. Then, Once you're in Sabang Port look for commercial boats (Bangka) bound to Guijalo Port fare is P120/person travel time will take 2 hrs. You can charter a shuttle van directly from Legazpi to Caramoan but its very expensive and the fare is relies on the discretion of the van operators. However you can follow the Option A, B, or D..... just go to Legaspi FILCAB (VAN) terminal or bus terminal and go to Naga City (fare is more or less P200). Then Naga to Caramoan preferably by bus. MANILA-VIRAC-CARAMOAN (NAIA 3 via airplane) note: this is not advisable if not summer due to strong tide in the channel. Manila to Virac Airport will takes only around 45 minutes. Then, from airport - take a VAN or a TRICYCLE ride to CODON PORT. Average Travel time is only 30-45 mins. Then, Codon to Caramoan will takes around 1hr. but you will be obliged to charter a special trip boat around P2,000 or up depending on the size of boat and the headcount of participants. As of there is a regular boat trip by MB HARRY Via Cab-Cab, Catanidaunes to Guijalo, Caramoan (fare is around P120). The schedule of boat back to mainland (Sabang port) is approximately 7AM, 8AM, 9AM, and 11AM. Traveling "by-land" from Manila to Caramoan will takes around 12 hrs or more, the Raymond Bus leaves Cubao around 2:30pm and will arrive in Caramoan around 4:00AM . From Naga to Caramoan will takes 3 hrs. or private vehicles of or 4 hrs or more for buses. (earliest trip of Florencia Bus is 3:45 AM and ETA in Caramoan is 8:00 AM. Buses available from Naga to Caramoan are Florencia, Raymond, and MRR). The estimated time of land travel directly Manila to Caramoan is 11-12 hours. (Manila to Naga is around 8 hours and Naga to Caramoan is around 3-4 hours. Please note your departure time so that you can estimate your time of arrival. Note: The following itinerary may be changed according to customer's preferred schedule, actual time of arrival, and weather condition (including wind velocities, sea tides/waves, etc). 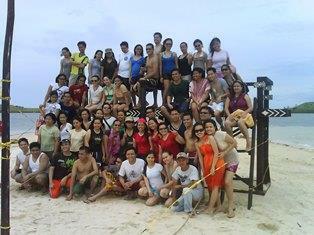 08:30-05:30 Lunch / swimming Island hopping activities/cave tour/mountain trekking rock climbing, etc. 05:30-07:00 Sabang port to Guijalo port. 07:30-08:00 Guijalo port to Caramoan town proper. 08:30-05:30 Lunch / island hopping, swimming, and other adventures. 05:30-06:00 Back to accommodation/ rest. 07:00-09:00 To statue of Our Lady of Peace (optional). 09:00-11:30 Island hopping, swimming,/cave tour/mountain trekking rock climbing, etc. 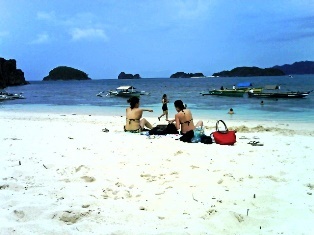 12:00-05:00 Island hopping, swimming, and other adventures. 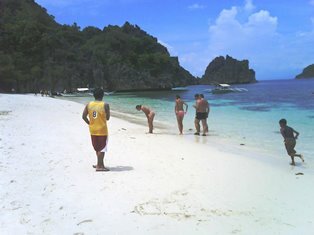 08:30-05:30 (Lunch), Island hopping, swimming,/cave tour/mountain trekking rock climbing, etc. 08:00-12:00 Eco-Tour and Nature immersions, site seeing to Caramoan forests, bird watching (Tayak Lagoon, Pitogo cluster of islands). 1:00-05:00 Island hopping, swimming, and other adventures. ​BOOK EARLY NOW TO ENSURE THE RESERVATION !!! PLEASE INFORM US AT CONTACT NO. 0946-881-1111 BEFORE AND AFTER DEPOSITING PAYMENT SO THAT WE CAN ENSURE THAT YOUR RESERVATION WILL BE PROPERLY PROCESSED & RECORDED OTHERWISE WE WILL BE GELD RESPONSIBLE FOR THE ACKNOWLEDGEMENT OR FAILURE OF BOOKING. Banco de Oro (BDO), PALAWAN Remittance, and SMARTMONEY are also available upon request. We are accepting major (credit/debit) cards with logos of Visa, MasterCard, Discover, American Express, and other major card payments through PayPal internet/online payment only. (Note: This option is strictly for internet payment only. We do not accept and process physical card payment using "swipe-card machine"). If you choose paying with card, we require customers to pay at least 5 working days before the schedule of trip.. Please inform us in our contact number/before and after the payment transaction at SMART 0946-881-1111. Requesting for Quotation. Requesting For Reservation. We will avail food package. We will not avail food package. Please feel free to type your complete message such as booking request, questions, and other details that you wanted to know. GOD BLESS AND SEE YOU IN CARAMOAN !! !